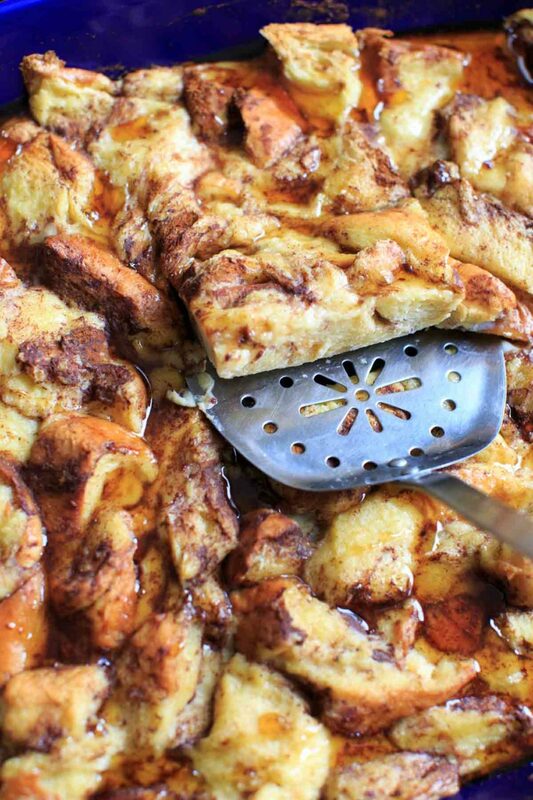 Overnight French Toast Casserole with cinnamon, vanilla and a secret ingredient. 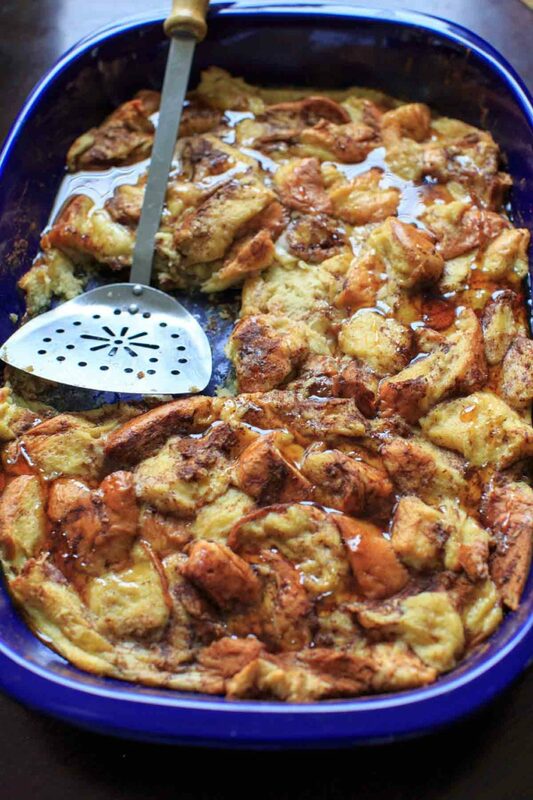 As healthy as french toast can be while still being an easy and delicious breakfast to feed a crowd. 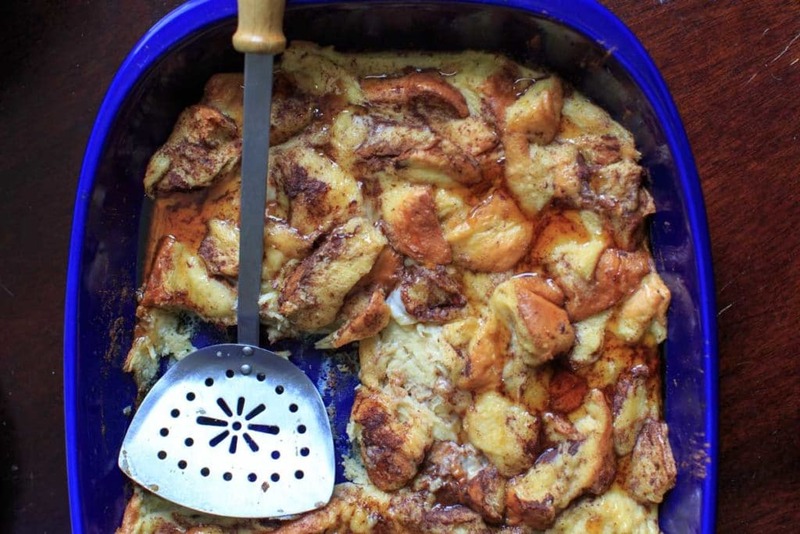 “Overnight breakfasts” have been a popular thing for a while now. I’m not sure why it’s taken me this long to jump on the bandwagon because the concept is right up my alley. Suffice to say I’m not a morning person and this is why I adore brunch restaurants so much. 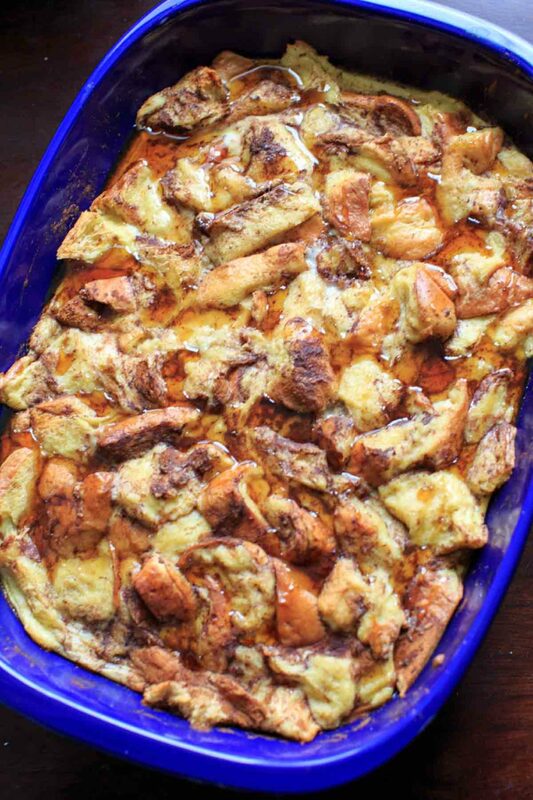 With THIS casserole it doesn’t have to be a special occasion to get your french toast fix. You spend 5 minutes putting it together the night before, and pop it in the fridge til you wake up. Then the oven will do the work for you while you’re sipping your morning coffee. So I have a “secret ingredient” I like to include in my french toast that gives it a unique flavor. Even better if it’s one of those orange juices that is mixed with another fruit juice. I like Simply Orange Juice with Mango, no pulp. It adds a unique sweetness to it. Depending on my mood I will adjust the amount of OJ I use but for this casserole I’d suggest 1/2 cup, and even a full cup if you decide you really like the flavor. But first let’s start with the bread. I used a brioche sliced loaf of bread from Trader Joe’s. I find that fluffy, egg-based breads work best (so challah bread is a good substitution) but sometimes I see Italian bread used also. Whichever bread you use, you’ll want to tear it up into pieces. The bread pieces should fill a 9×13 casserole dish. In a bowl, you’ll whip together eggs, milk, half and half, OJ, and vanilla. Pour that over the bread pieces and sprinkle with cinnamon. Then put in the refrigerator overnight (or at least a few hours) to allow the bread to soak up all the egg mixture! After baking for 30-45 minutes (longer if you prefer crispy and less if you prefer soft), drizzle with maple syrup. I like mine around 35 minutes. Depending on how hungry you are it should yield 6-8 servings. Don’t you want to just smash your face in it? It can’t just be me? Like a pie eating contest. A french toast eating contest. That should totally be a thing. What other overnight recipes should I try? Another overnight french toast recipe: Blueberry Cheesecake French Toast! Tear bread into pieces, slightly larger than bite sized. 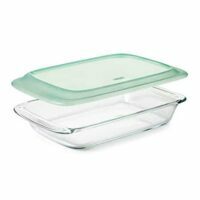 Place in 9x13 or 3 quart casserole dish. In a medium bowl, whip together eggs, milk, half and half, OJ, vanilla and cinnamon. Pour evenly over bread pieces. Cover and place in refrigerator overnight or at least a few hours to allow the bread to soak up the egg mixture. 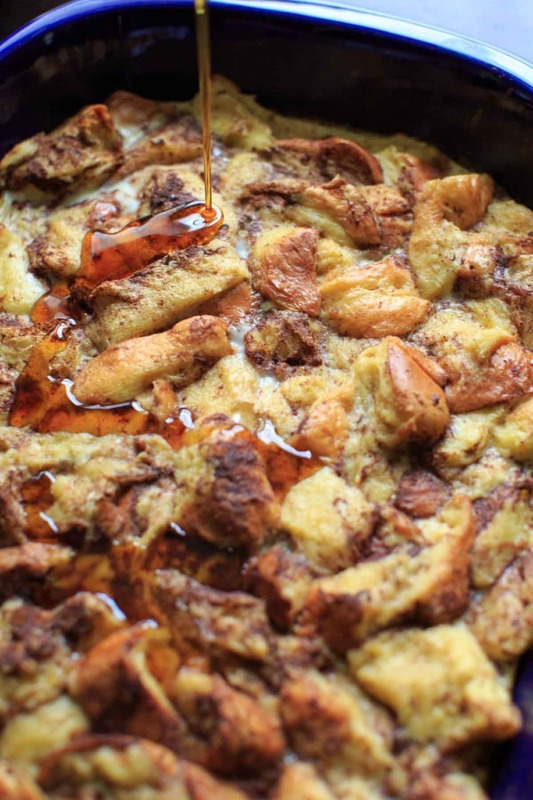 Remove from oven and drizzle maple syrup on top. Serve warm. The bread I used was 12 thick slices of brioche sandwich bread. This was very good. I couldn’t find the mango orange juice so just used regular orange juice. I used 1/2 loaf of French bread and 1/2 loaf of Kings Hawaiian bread. Before putting in oven I melted 1/2 stick of butter and added 1/4 cup brown sugar and poured it over top of bake. It is definitely a keeper! Sounds like a great combination of breads and a delicious choice of topping! Should this be baked with foil covering the dish or without? Thank you! Have you tried doubling this recipe? Did anything change ?